Awesome lil' layout for this! Works great with a Ge Q1 depending on the bias. So you built it? Verified? What was the Hfe of your Ge Q1? did you measure leakage? Hfe was around 150, didn't measure for leakage, and several other Ge samples didn't sound good. Q2 was a metal can 2N2222 or a BC109, I think. The "tone" control mixes the two distorted transistors, I think. You can have just Q1 at one end, then the other one phases in. Dragonfly's "wrong" capacitor sounds alright too, but a bit buzzier. Pretty sick for such an simple design. I put on 2N2369s, and it's really splatty. I tried it with Escobedo's Tripple fuzz in front of it, and wow. Don't know if i'll ever box that though. But it's wild. I built this one a while ago. It was my first attempt at building a real nasty splatty fuzz. I like it better than the Fuzz-rite and better than the Shin-Ei as it is a little of both. It sounds amazing on bass too but what I really like about it is that it is totally different than the FF or the BMP or even the Maestro Fuzz Tone. It's simple and mean. The Tone goes trebely as you crank it higher. You've got the TONE lugs backward from what I see on my build. The Tone and Volume are very interactive. very buzzy on neck pickup: You can get some great "Spirits in the Sky" (don't use a pick) and even "Pushing Too Hard" solo (lower Tone Knob), "Satisfaction" riff. 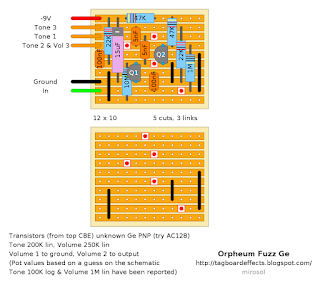 If you are referring to the Andrew Carrell schematic from 2009 than the Germanium version has 200k and 250k for the Tone and Volume, respectively. The Silicon one doesn't show the values but the one I built which is super wicked was 1M Lin and 100kA. If anyone can share experience with various values and recommend the best it would be great. Whoa mirosol, you read my mind... 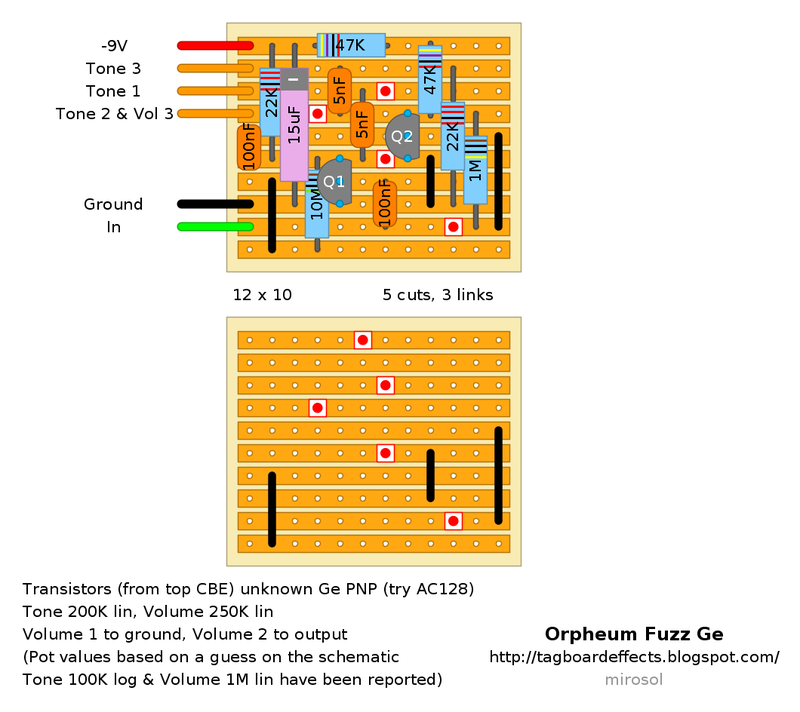 I actually built a silicon Orpheum fuzz JUST LAST NIGHT based on Dragonfly's old layouts, but correcting the .01uF to .1uF. This was per a thread on DIYSB where a guy who had one tested the values of the pots in his. But perhaps I got this wrong and those values were for the Germ version? But either way, one of them has 1M and 100k pots. For some reason I cannot seem to connect to DIYSB at the moment (all requests are timing out), so I can't reference the exact thread. I breadboarded a silicon one with the 100k+1M pots combo and wasn't impressed with the tone control at all as I could only get good fuzzy sounds when I had it cranked. Definitely worth trying out a few values. I second the love for the advent calendar! This site friggin rocks! I like this better with 2N4401 compared to 2N2222A and 2N3904. With 2N4401 the tone control (A100K) is more useful. Really really like this site !! Do you mean 2N4401 for both? I didn't feel too much of a difference between the various combinations with those trannies.It could be more related to the hfe than to the 2NXXXX name. Nevertheless, after a few replacements back and forth, I did leave it with both Q1 and Q2 at 2N4401. Thanks. Try a little spring reverb and an AC30 amp. Great Ennio Morricone Spaghetti Western sound. If you like this, also try the fuzz rite. Fuzzrite is more refined and very touch responsive in a way. (my Fuzzrite is with 2N2222A and 2N4401. I've built the Fuzzrite with the RFNR Green Bomb Modifications which add some more versatility to the pedal. It's such a great pedal. I've also ended up using a 2N222A and a 2N4401. Guess we have the same taste. The Orpheum gets me more to the "Pushin' to hard" solo by the Seeds (also fantastic with bass). The FuzzRite Green Bomb is more Spaghetti Western style. Just finished this build, 2N2222's and 47k tone 500k volume pots (all I had), the tone pot seems odd, more like the level pot from a Fuzzface, it's nice and splatty when it's cranked but like a nasty (in a bad way) overdrive under about 2 o'clock. Goes well with the Magnavibe though. For me Q1 needs higher hfe than Q2 in the Si version. I have BC108s, 274/24 (!) hfe. A 2n2222a (100ish hfe) works well too in Q2. Above that in Q2 and the sound gets too gated. 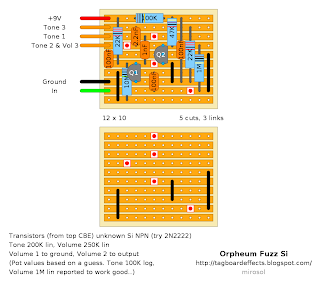 I have a fuzzrite and FY-2- must I box this too? Indeed you must. The Orpheum, for me, is the best 60s, spaghetti western, psych garage fuzz. 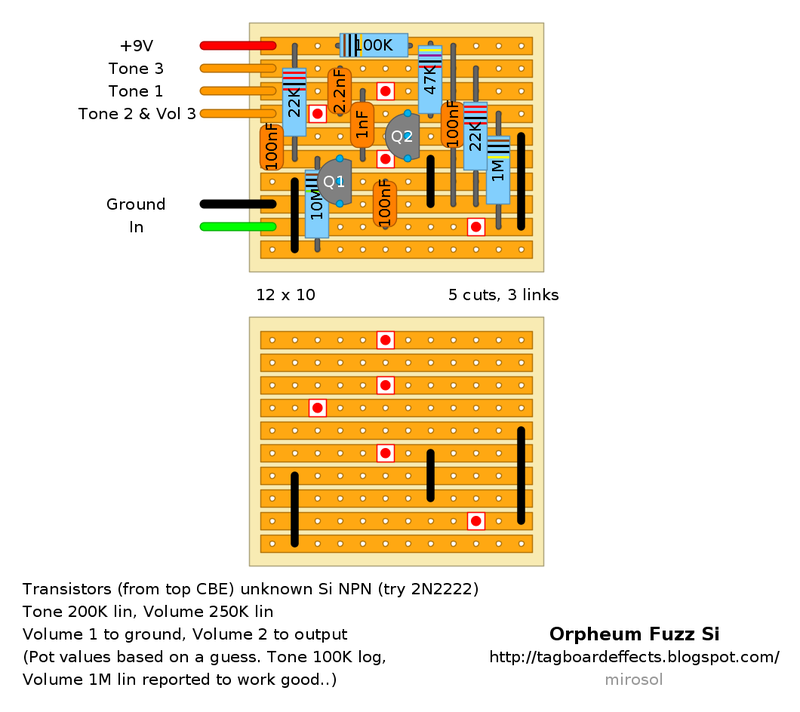 It has the most buzzy noise ever similar to the FY-2 but the versatility and playability of the Fuzzrite. Try it on Bass, it is just awesome. Did anybody compare the Dragonfly (Andrew Carrel) versions from 2008 and 2009? the 2008 had a 1M 100kA Tone/Vol combo and the 2009 had the lower 250-500k unknown combo with some parts variations. please explain the difference between them. I built the 2008 which is wicked but my fingers are tingling to give a go at the 2009 version. wondering if i could substitute a lower value for the 10M resistor on Q1... what does that R do exactly? feed a low Voltage back to the base? i tried a 1M and the fuzz tone seems different.. for obvious reasons. I have recently started playing again through the Orpheum pedal which I built because it is just so awesome. Did anyone manage to build a silicon version which doesn't introduce a lot of RF and static noise on the higher settings of the Tone/Fuzz pot? It is just so noisy on the best tone setting that it is really a shame. Si version doesn't have one, so that could be one thing to try too. Assuming it is caused by power supply. Thanks mirosol and dave. I'll give it try. Orpheum and Fuzzrite have just become my primer go-to fuzz these days so getting rid of noise is such a crucial thing for using these pedals live. Yep, Another build. Not so sure about this one tried with both 2N2222As and 2N5088s and its a tad splatty on the higher strings to the point of the sound vanishing. Alright with the tone pot at the lower end. Might have to try some other transistors before i find the right ones or combo.